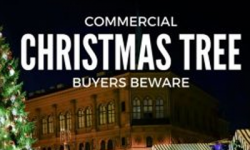 A top-quality commercial Christmas tree is an investment that will pay many dividends throughout decades of service. But buying a commercial Christmas tree is a major expenditure. And for all sizable purchases, caution is warranted. That's because most industries have their scam artists and snake-oil salesmen. And unfortunately, the Christmas industry is no exception. There are less-than-reputable companies in this industry whose only goal is to separate you from your money and then disappear. 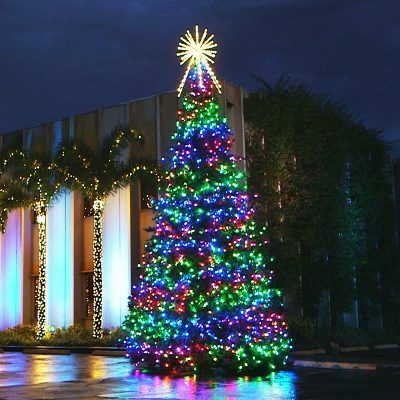 A school in Georgia was recently in talks with a 'company' in China about purchasing a commercial Christmas tree. Large, top-quality commercial trees are expensive - there's no getting around that. But the Chinese company was offering a tree that would cost roughly $23,000 from any U.S. manufacturer for only $4,300 delivered - as documented in the accompanying invoice. The tree in the photo is one of our trees installed on a customer site; the photo itself was apparently stolen from our website. The company asked for 30% down. But we have vast experience in dealing with companies in China. It's S.O.P for Chinese companies to require 100% upfront before shipment. Shipping alone on such a tree would be in the range of $2000. The $750 cited in the invoice for shipping wouldn't even get the tree from the port-of-entry to Georgia. Delivery within 20 days just isn't feasible. The best-case scenario for a shipment of that distance (by ship) is 30 to 35 days. Had the school gone ahead with the purchase, the very best they could have hoped for would be a pile of garbage for their $4,300. The near certainty is that they were dealing with scam artists who would have absconded with their 30% deposit, never to be heard from again. When you're considering making a major purchase from any company, the age-old vetting criteria applies: If the offer being made seems too good to be true, it most likely is.